Neurotransmitter transporters play a key role in depression and neurodegenerative diseases (NDD) such as Alzheimer’s and Parkinson’s. The ability to monitor serotonin, norepinephrine, and dopamine transporter (SERT, NET and DAT, respectively) activity in expressing cells, transfected or primary, is key to a better understanding of these diseases. Until recently, radioactively labeled compounds were used to measure serotonin, norepinephrine and dopamine transporter uptake. With the introduction of the Neurotransmitter Transporter Uptake Assay Kit, researchers now have a tool to screen for live-cell kinetic uptake for these three key neurotransmitters. This assay utilizes a Molecular Devices masking dye to extinguish extracellular fluorescence. This masking dye technology has been exclusively licensed from Bayer AG (U.S. Patent Nos. 6,420,183, 7,063,952, 7,138,280 and European Patent No. 0,906,572). The assay also includes a novel proprietary fluorescent indicator dye that mimics the neurotransmitters serotonin, norepinephrine, and dopamine, and is actively transported into the cells via the neurotransmitter transporters. Figure 1: HEK cells stably expressing human SERT were plated O/N at 10,000 cells per well in poly D-lysine-coated 384-well plates. Medium was removed and nisoxetine (published Ki = 383 nM) in HBSS/0.1% BSA was incubated with cells for 10 minutes at 37°C prior to dye addition. 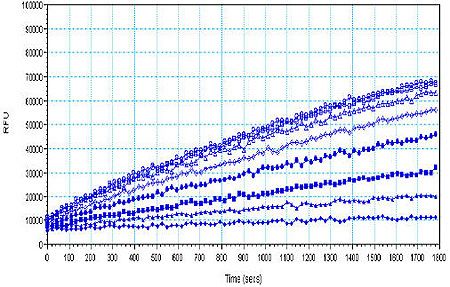 The assay was performed according to the Experimental Protocol and read on Molecular Devices’ FlexStation® 3 Reader in kinetic mode for 30 minutes. Figure 2: HEK cells stably expressing human NET were plated overnight (open blue circles) or on the day of assay (filled black squares) at 20,000 cells per well in poly D-lysine-coated 384-well plates and allowed to adhere for 3 hours. Medium was removed and nomifensine in HBSS/0.1% BSA was incubated with cells for 10 minutes at 37°C prior to dye addition. The assay was read on the FlexStation® 3 Reader in kinetic mode for 30 minutes. The inhibition curve is expressed as area under the curve. Figure 3: Cells stably expressing human DAT, NET and SERT were plated overnight at 60.000 cells/well (96-well plate) and treated with 8 different known inhibitors. 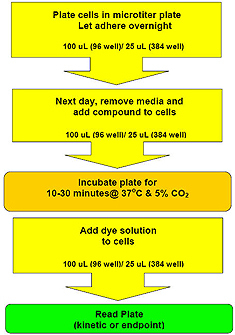 After 10 minutes the Dye Solution was added and the assay was run according the protocol described above. The log Ki was calculated from the resulting data using the Cheng-Prusoff equation and a correlation with known Ki values for all three transporters was determined. The correlation coefficients R2 for each transporter is presented in the graph, the correlation coefficient (R2 value) over all 24 values was 0.91. 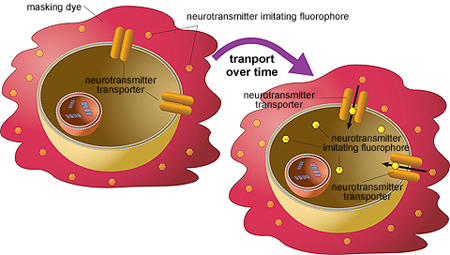 The Neurotransmitter Transporter Uptake Assay Kit uses a fluorescent substrate that mimics the biogenic amine neurotransmitters and is taken into the cell through those specific transporters, resulting in increased intracellular fluorescence intensity that is monitored in real time using a bottom-reading microplate reader. In this convenient no-wash procedure, cells are incubated with the kit reagent and transferred to the plate reader for evaluation. The assay is ideal for use in academic, biotech, and pharmaceutical environments for research, assay development, and screening. Solvent Tolerance: This assay can tolerate a final solvent concentration of up to 1% DMSO or Ethanol with minimal impact on the precision or the overall assay performance in the cell lines tested. Cell Density: Density of the cells and cell plating could influence the assay performance as well as the signal readout. Therefore, it is recommended that the cell plating information supplied in the product insert be used as a guideline and that further optimization be performed to maximize assay performance. Same-day Cell Plating: Cells can be plated on the same day that the assay is run without compromising the assay performance or precision. However, it is advised that the cell number and the amount of time for the cells to adhere to the plate be optimized for the specific cell line. BSA Addition to HBSS Buffer: Similar performance is seen with or without the addition of BSA. However, the use of BSA can help reduce binding of compounds to the walls of the plate well or pipet tips. Order of Reagent Additions: Changing the order of reagent additions, i.e., dye before inhibitor, may result in a reduced signal. Therefore, following the suggested protocol and guidelines is recommended to ensure the desired assay performance.